The Secret Weapon: Fudgy Wudgies. Alicia was one of my roommates my freshman year of college. She came to school armed with good looks, a fun personality and a Secret Weapon for catching boys: Fudgy Wudgies. A delicious, buttery, oatmeal ‘n’ fudge bar cookie that almost no one can resist. Luckily, Alicia and I became best friends and she shared the recipe with me. Then taught me how to cook. Now that we are both happily married she has agreed that the recipe for this Secret Weapon can now be shared for the greater good. Consider yourselves very lucky. I know I am to have such a wonderful friend and a bootleg copy of her family’s cookbook. Buddy, where would I be without you? 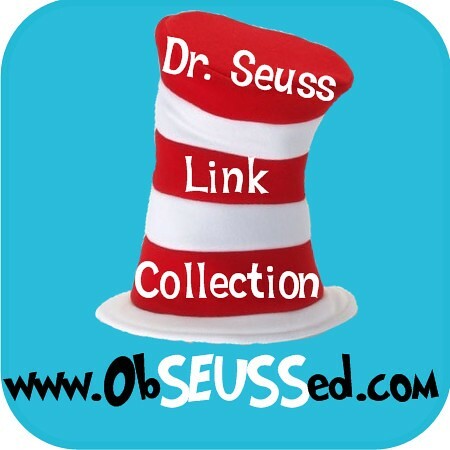 Preheat oven to 350 and grease a 9″x13″ baking dish. Stir until smooth, then add 1 tsp vanilla. Set aside. Spread 2/3 of the Wudgy mixture in the bottom of the pan. 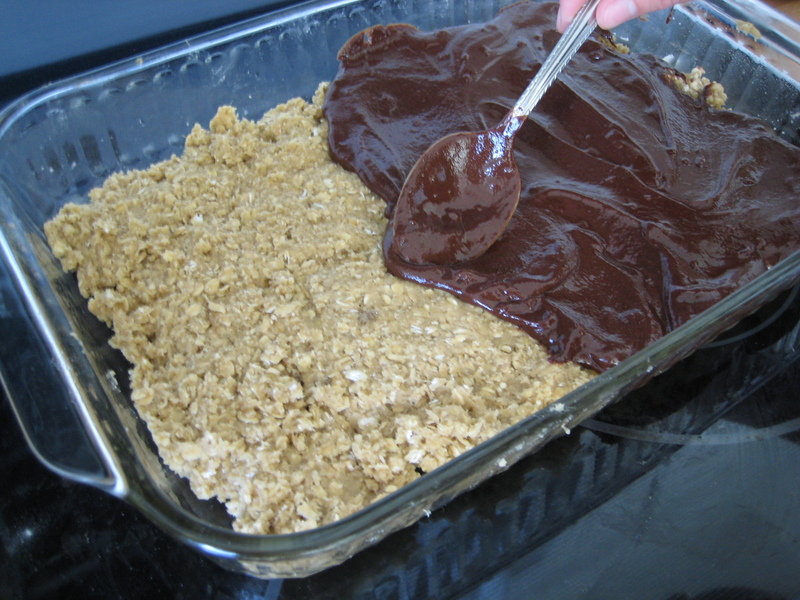 Spread Fudgy over the top (do not scrape the bowl completely clean, you will regret it). 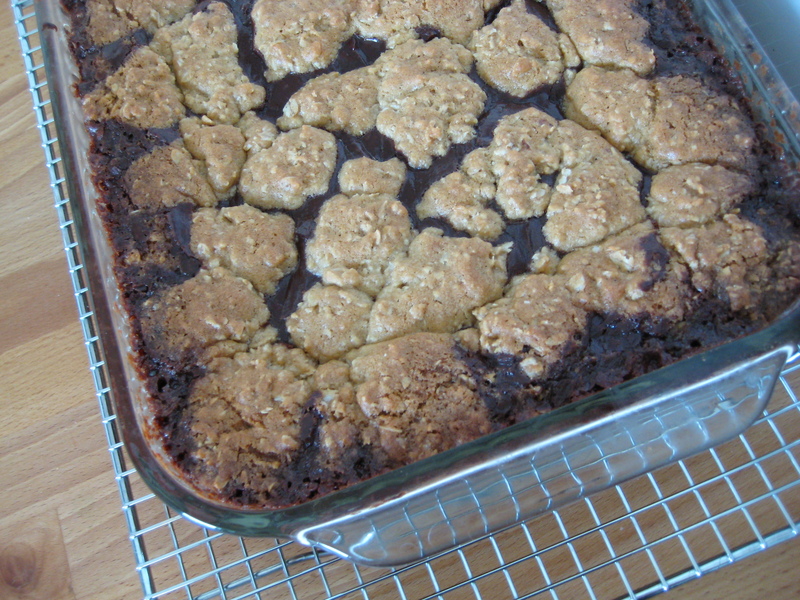 Drop small chunks of Wudgy over the top, leaving some of the chocolate layer exposed. You will probably have a little bit of Wudgy left over. Save it. Put Fudgy Wudgies in oven and bake for 25-30 minutes. Now for the best part: dip some of the leftover Wudgy into the Fudgy and eat. Repeat until you have cleaned both bowls. Fudgy Wudgies take a while to cool and set up so that they can be cut without a fudgy landslide. 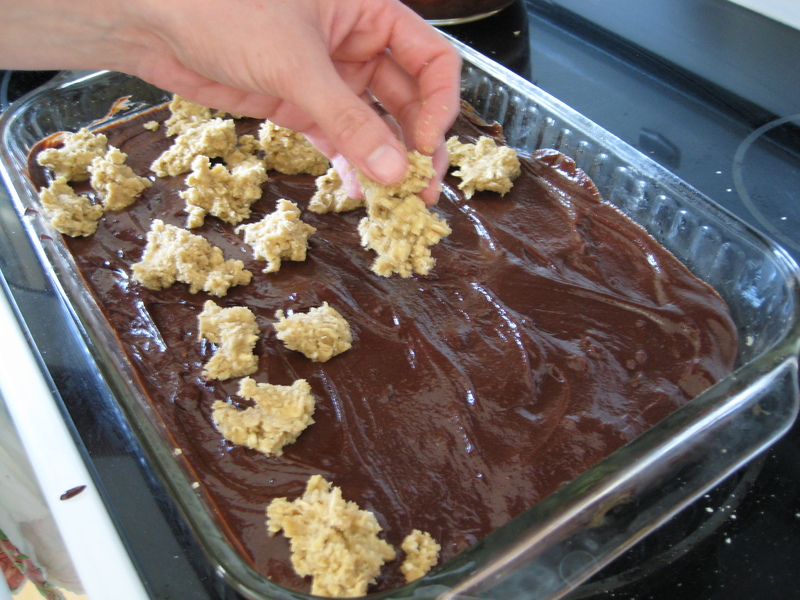 Plan on at least an hour before cutting into bars, or longer if you are plating them to take to friends. Also plan on being the recipient of many compliments and/or offers of marriage. Happy 3.14, fellow nerds! I learned this year that today is also Albert Einstein’s birthday. It’s a Pi Day miracle! 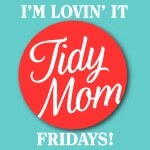 For all you nerds & non-nerds alike, here’s another tasty post from my good friend Momo. Tell me I’m not the only one drooling over these photos! Even though I know Catherine LOVES this holiday, she was nice enough to let me share a recipe for Pi day. So here is a delicious Peanut Butter 3.14 to celebrate this fun holiday! 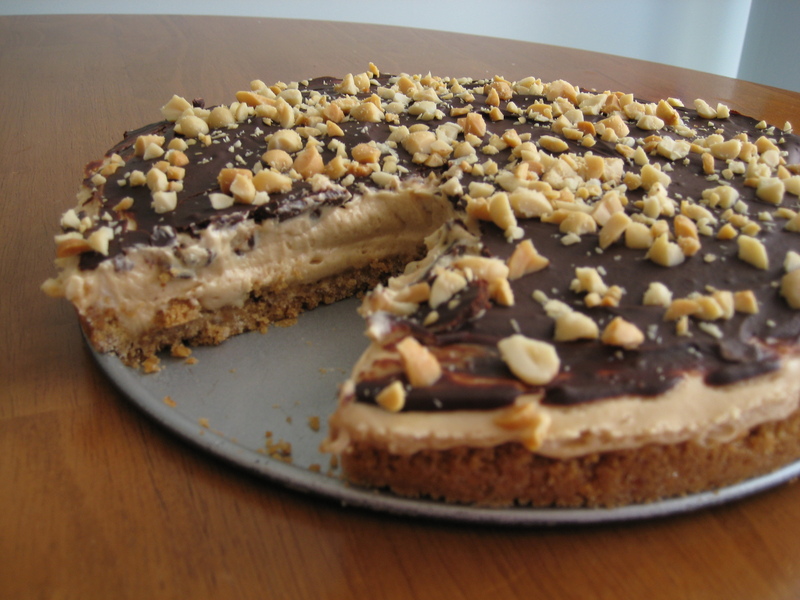 This is a recipe I tweaked from the New Better Homes and Gardens Cookbook to resemble the amazing Peanut Butter Torte they used to serve at the Skyroom when Lisa and I worked there. Melt butter, stir in sugar. Add crushed crackers, toss to mix well. Spread evenly into a 9 inch springform pan (a pie pan will also work). Press onto bottom and sides to form an even crust. Bake in a 375 degree oven for 4-5 minutes or until edge is slightly browned, and cool on wire rack before filling. Chill a medium mixing bowl and beaters (I actually use my immersion blender). For filling, beat cream cheese and peanut butter until smooth. Add the 1 cup powdered sugar, 2 tablespoons milk, and 1 teaspoon vanilla; beat until combined. In the chilled mixing bowl beat whipping cream and the 2 tablespoons powdered sugar until soft peaks form (this happens pretty quickly). Gently fold about 1/3 of the whipped cream into the peanut butter mixture. Fold remaining whipped cream into peanut butter mixture. Spoon into graham cracker crust. Cover and chill about two hours or until set. Melt ¾ cup semi-sweet chocolate chips and a little milk (1 to 2 Tablespoons). 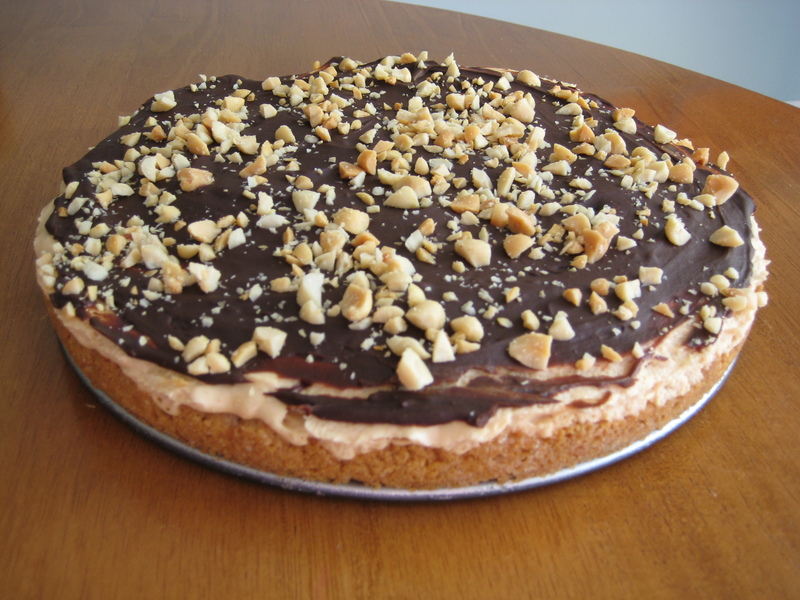 Spread over the top of the chilled pie and sprinkle with lightly salted, chopped peanuts. Let chill until set. Eat until you’re sick, or invite your friends! They will love you! As promised, here is the first of what I hope to be many contributor posts from talented friends who’ve taught me a thing or two about domesticity. I first met “Momo,” as her firstborn writes her name, in Indiana when our husbands were both toiling away in law school. Countless late-night board game sessions & a couple trips to the Monroe County Fair later (trust me, it’s an experience), I consider her my very best friend. We’re conspiring to move to the same city so we can be neighbors again, but until the planets align to make that happen, she & her family are living in smalltown Idaho. She’s a fabulous cook; some of my favorite recipes are hers, written down on “High School Musical” stationery. I know you’ll love them too — even without Zac Efron smiling back at you as you read! I can’t help thinking of that old ditty about beans being good for your heart as I share this recipe. Heart health has become an important issue in our family recently, so the “heart” part of Valentine’s Day will take on new meaning for our holiday eating this year! While we will still be having the occasional yummy treat or two, we will be eating healthier overall. This recipe is one I have been making for over a year and that is well loved by all of us, #1 and #2 included. 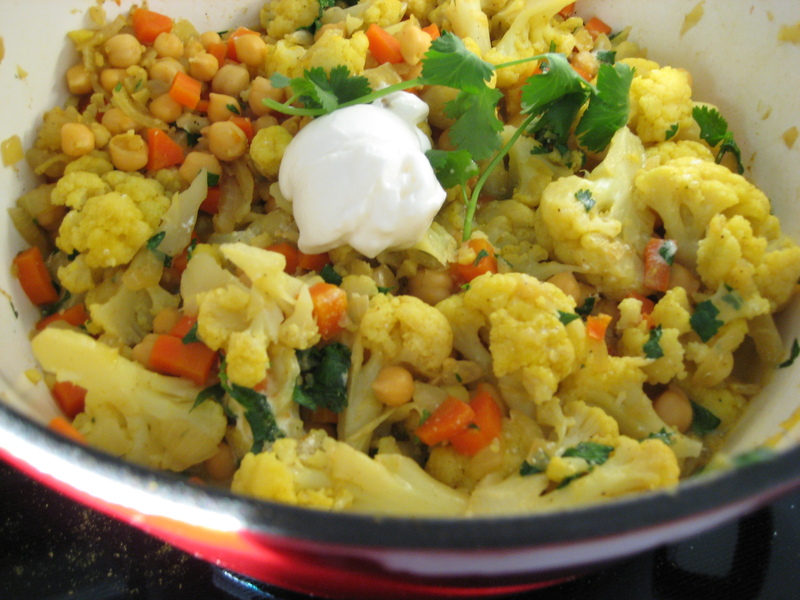 It is perfect for this time of year when cauliflower is abundant and inexpensive. I have eliminated any added salt to make it healthier, and for us the curry is strong enough that we don’t miss it. The only “exotic” ingredient involved is fresh ginger, but I can find it at my local grocery store, so don’t be afraid, you can too. 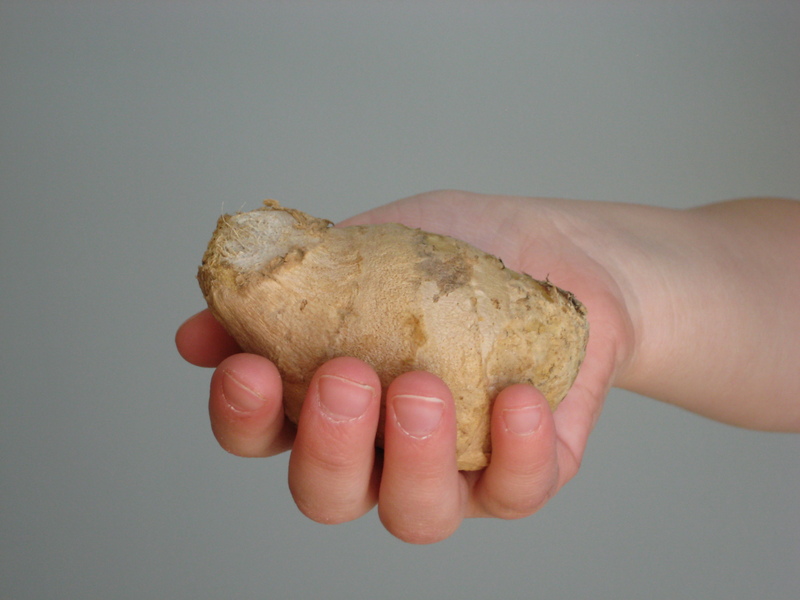 This little nugget of ginger (in #1’s hand) was enough to make this recipe twice. I always choose the smallest piece I can find and it is usually more than enough. Have all of the vegetables chopped and ready before you begin. In a 6 quart dutch oven or a similar size soup pot, heat oil on medium heat until hot, then add carrots and onions. Cook for 10-12 minutes or until lightly browned. Stir frequently. Stir ginger and curry into carrot mixture and cook for 3 minutes, stirring constantly. Add broth, cover pot, and bring to a boil on high heat. Stir in cauliflower and garbanzo beans. Cover and cook on medium heat for 15-20 minutes, stirring every 5 minutes, until cauliflower is tender. Stir chopped cilantro and yogurt into stew. Serve in bowls over rice and top with additional yogurt and cilantro if you like.